Barbara Manwell was my model this morning! I really like Barbara because she is so natural, real, and a beauty in her late 60's. Her eyes are like aquamarine jewels. She is my student and friend. I am loving this project. 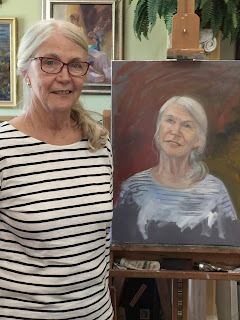 The paintings are nothing like my formal portraits because they are so fresh and unaltered from my first impression of the colors and character. They aren't perfected. They are a reaction, a "study". It's enlightening as a painter to be able to let go of a painting after 3 hours when you are used to working for hours and hours on a painting, working and reworking until it is perfect. This is fresh and fun. Like letting go of an addictive behavior, though, it is hard to do. This morning I received a criticism to my painting on Facebook stating “too bad she didn’t capture your real beauty” or something similar. And maybe what this month is all about is allowing a new vulnerability for my models and myself. After I read the displeased statement on Facebook, I did two things. I deleted the statement for the sake of my own self-protection and then I unwillingly had a long nosebleed. (What can I say?!) I wasn't angry, just contemplative as to what it means and how to react. I have learned how to stay calm on the outside and yet my blood pressure rising is obvious that I am still the very sensitive person I have always been. I wasn’t upset. 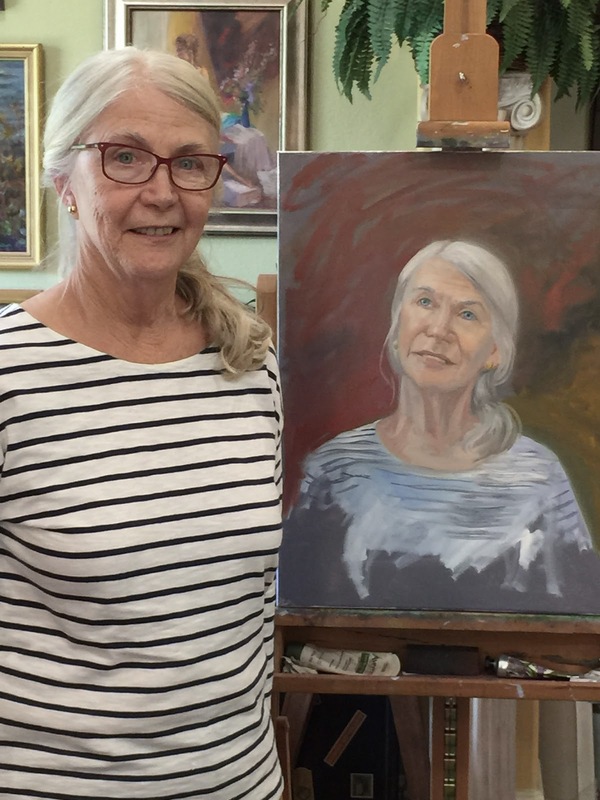 I knew that I didn’t capture Arlene’s cheerful nature; yet, I look at that painting and don't want to change a thing. It's very sensitive as I find Arlene to be. Maybe there is more to experience in life that this 'allowing' will bring forward. Maybe I need to let my guard down more to let things just happen. Let go and let God. (Please God, no more hard lessons though!) This plan seems like one of those ideas that come from beyond me and so maybe this is the underlying reason: I need to allow myself to be more vulnerable. In my early life, I allowed it often and I have had many great experiences because of it. But, harsher ones the older I got, so I have been very protective in the last years. Maybe this is the wake up to start opening my mind and heart to more new experiences. I hope so. (LOL ... this type of talk can't be avoided ... there is a deep analytical philosopher in my soul.) I work so hard to protect myself from criticism and rejection -so much that I don’t take chances. Yet, this month, I am really allowing myself to be vulnerable with this project, as my models are allowing themselves to be vulnerable to my observation and ability to immortalize them. I am so thankful to my models with beautiful spirits and souls. 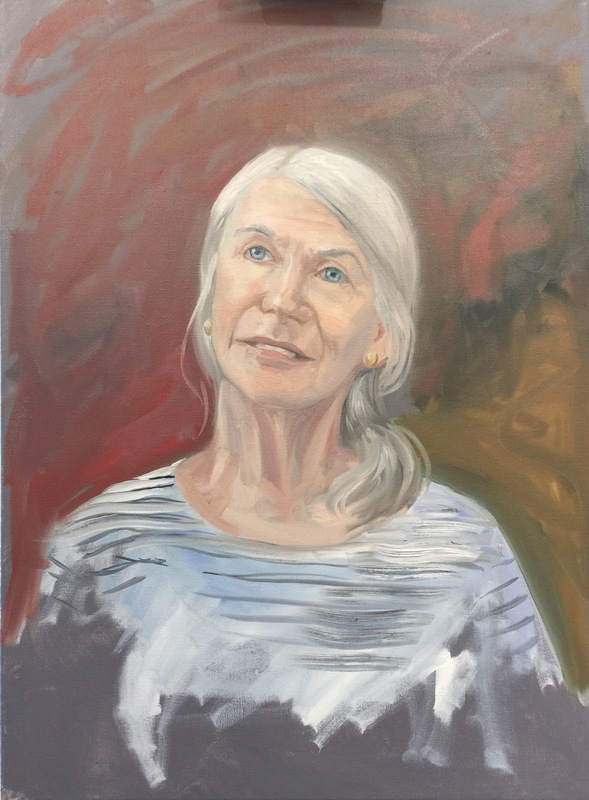 Artist's style: Although I have had a great response from my sitters, I knew there was a chance that there would be some portraits that people wouldn’t feel brought out the best or didn’t capture their image the way they wanted to see themselves. AND, I totally understand the artists that end up going to the point of distortion of the image as to avoid the whole dilemma of capturing someone the way they want to be captured. When I do a formal portrait, I spend hours smoothing and making my brushstrokes and color values/temperatures subtle to flatter my subjects. I thoroughly interview the families ahead of time to try to pick up on anything that might be an issue for them in the way I portray them. I spend over 30-40 hours in the process of painting a classic painting in order to achieve the perfect effect that flatters but also shows them at their best. With this project there is no time to really put that extra effort in to doing anything but reacting to what I see and putting it down on the canvas. So, I am setting myself up for this kind of vulnerability as are my models. But, isn’t that what this exercise is supposed to be about? Should artists paint to please others or should they paint what they interpret from their own personal vision and insights in life? It’s as though we are talking about two different subjects when we speak of the two ways to paint, but we aren't. Yes, as a professional portrait painter for 33 years, (August 16, 1982) I have been adjusting people’s images to be only the best they can be seen. So, I am great at painting to please others. But, how can any artist paint without their own personality showing, even in those circumstances? It's inevitable that my personal influence to a subject will show up especially when I paint fast. I know many gallery owners and other artists who would say "Bravo!" to this because they feel that art is merely an expression of the artist and should not be constricted to please anyone but the artist. And yet, it is very difficult to allow vulnerability when there are so many opinions out there to sabotage a good artist. Which brings me to: What is the artist’s responsibility? If I were a museum artist whose goal was to only show the world exactly what I see in every minute change of value and color, the world might appear a bit more in high contrast for me. I see and feel everything because I am as sensitive and analytical as I am and know so much about psychology. I tend to be the truth seeker in life and it shows when my work is as honest as it is in these 3 hour paintings. Is it my job to do that, really? ... to show what I see without a filter? Or is my job what I have defined it to be over the years ... showing what I want in well worked pleasing paintings? Isn't that my personality showing also?